I first saw Sarah Lohman speak as part of The Masters of Social Gastronomy a two person food seminar in Brooklyn on the history of BBQ. It was a great presentation and since then I've heard her speak about the history of sourdough bread as well as Chinese Takeout. When I found out she had written a book I instantly asked for an advanced review copy to read through and she was nice enough to send me one. 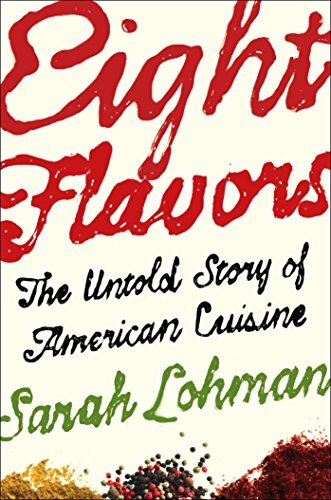 Her book is Eight Flavors: The Untold Story of American Cuisine and it is a fascinating deep dive into 8 different flavors from American cuisine, where they come from, and how they got adapted into American cooking. Sarah manages to share all this info in an engaging and entertaining manner...making the reading go fast while making you very, very hungry! Curry Powder - appeared for in an American cookbook for the first time along with ice cream...if ice cream is "American", so is curry powder! As a country of immigrants with a cuisine taken from around the world, it was great discovering how much diversity we have had in our cooking over the years and how many "trendy" flavors have actually been here for as long (or longer!) than apple pie! In addition to all the historical information, Sarah also discusses several long-ago recipes for each flavor and even provides several updated versions for today's cook. I highly recommend this book to anyone that likes learning about the history of our food and culture. It's a really fun book to read while still being real informative. You can find it online at Amazon.com. Do you have a favorite flavor? Let me know in the comments!